Perhaps unsurprisingly, given his meteoric rise to fame, the main themes of the album are press intrusion and tabloid sensationalism. And, in a neat irony, the rise of technology-led, assembly-line music was also in Kershaw’s sights, despite Musicola making liberal use of all the latest sampling and synthesizer technology. So let’s get Musicola‘s duff tracks out the way first – ‘What The Papers Say’, ‘Nobody Knows’ and ‘Running Scared’ are jarringly overproduced, though the latter had real potential. But there are loads of treats elsewhere – ‘Life Goes On’ is a musically-rich, very pretty ballad with swooning chord changes and fine vocals from Kershaw. ‘LABATYD’ is pure class, a half-time shuffle with tasty Mark Brzezicki drums, an excellent Kick Horn arrangement and soaring synth by either Wix or Andy Richards. ‘Don’t Let Me Out Of My Cage’ is pretty damn ambitious fare for a pop album, a fast swing number featuring some cracking Phillips drums and effective close-harmony backing vox from Mrs Kershaw (Sheri). ‘When a Heart Beats’, an excellent, intricate slice of pop/prog in the It Bites mould, gave Kershaw his last top 40 chart appearance (peaking at a disappointing #27) when it was released in November 1985. The closing ‘Violet To Blue’ is possibly Kershaw’s finest and most ambitious recording to date, featuring some rousing vocals from the London Community Gospel Choir and superb, driving drum work from Phillips (much imitated in my music room back in the day). An interesting album which clearly fell between the stools of art and commerce, Radio Musicola reached a barely believable #46 in the UK album chart, just over a year after Kershaw had played Live Aid. It disappeared without trace in the US. The little girls had certainly grown up. Or maybe it was the new haircut. 18 months is a long time to leave between albums when you’re hot. But Kershaw didn’t seem bothered about his new ‘selective’ popularity; in fact, he seemed genuinely relieved, but wondered how MCA were going to sell him now that he was focused on being a musician rather than a pop star. Despite the poor album sales, Kershaw embarked on a sold-out UK tour in early 1987 including three nights at London’s Town & Country Club. And he would be back once more before the ’80s were out to deliver perhaps his finest solo album to date. Yes, yes, this might be a hard sell for some, though one wonders how many readers outside the UK will even have heard of Nik. 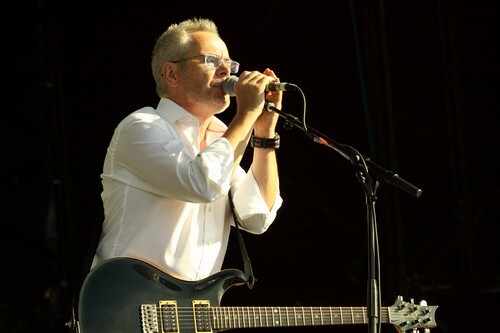 After several years playing guitar in cover bands and fronting East Anglia blue-eyed-soulsters Fusion, Kershaw wrote a few poppy-sounding tracks and suddenly found himself thrust into the solo spotlight. But he didn’t fool anyone with the snood, fingerless gloves and mullet – it was obvious that Nik was a serious muso (what a horrible ‘80s word). This very talented and rather underrated artist had a voice a bit like Stevie Wonder (though my dad rightly identified something Numanoid too), played guitar a bit like Allan Holdsworth and wrote clever, catchy pop songs with prog, metal and funk undercurrents. He also had some very famous fans in the US including Miles Davis and Herbie Hancock. But his image, dreamed up by some wags in MCA’s marketing department, really didn’t do him any favours – Smash Hits summed it up perfectly, calling him ‘the thinking man’s Limahl’. The Riddle is probably his best album. It was recorded pretty quickly to cash in on the unexpected success of his debut Human Racing, though featured a fair amount of post-production courtesy of the excellent Peter Collins who later produced Rush’s Power Windows. The Riddle features a very solid but expressive rhythm section (Elton John sticksman Charlie Morgan and ex-Secret Affair bassist Dennis Smith plus a great guest appearance from Level 42’s Mark King on ‘Easy’). Kershaw’s use of synths was kind of revolutionary, with intriguing sequencer patterns and lots of subtle, almost subliminal pads (dare one posit a Gil Evans influence?). Yes, The Riddle screams the mid-1980s, but, most importantly, every song on it is memorable and has a very distinct flavour. On a songwriting level, Kershaw always knows how to keep things interesting for the listener. ‘Know How’’s taut, white-funk groove always used to remind me a bit of Talking Heads, but the silly/funny spoken-word bit and weird prog sections approach the It Bites sound. Miles apparently recorded a cover of the very pretty ‘Wild Horses’ which has never seen the light of day. Hollywood-baiting ‘City Of Angels’ and eco-themed ‘Roses’ have more than a hint of Steely Dan about them, partly due to the use of the famous Purdie Shuffle, nicely reformatted by Morgan. ‘Wide Boy’ and ‘Don Quixote’ have lots of interesting melodic modulations under their pop sheen. ‘Easy’ is a brilliant band performance and crafty composition with a nutty middle eight, while the closing ballad ‘Save The Whale’ is also musically rich and lyrically well-intentioned if naive. And though the title track divides opinion, to say the least, check out its two-chords-per-bar middle-eight for a great example of Kershaw’s craft. The cover photo was taken at Chesil Beach in Dorset. The Riddle peaked at #8 on the UK Album Chart and went multi-platinum. The lead single was the title track which reached #3 in the UK. ‘Wide Boy’ peaked at #9, whilst the third and final single release ‘Don Quixote’ got to #10. Three top 10 hits from a sophomore album – pretty damn good.